Got those SUV blues? We have the solution! Also, a look at piggish parking by biggish vehicles. NEW! US 6 sign in Bishop, CA with the mileage to Provincetown. mahighways.com & maroads.com is under construction, like the Central Artery! View across Connecticut River to Sunderland as seen from Sugarloaf Mountain. A 1937 highway map of Boston and Vicinity, General Drafting Company. A 1952 Downtown Boston route map, AAA. Distinctive Highway Signs (coming soon). Thickly Settled. "A 'Thickly Settled' district is an area where houses or other buildings are located, on average, less than 200 feet apart." If you find a "Thickly Settled" sign in Massachusetts, don't think of it as a quaint sign. Consider it as a 30 mile an hour speed trap because the law states that speeds over 30 mph in a "Thickly Settled" or business district are not considered reasonable and proper. Trolleys. "If you come to a trolley letting passengers on or off, you must NOT drive any closer than within 8 feet of the trolley passenger step." Memorize this, as it always appears on the written test. Rotaries. According to the driver manual, "When you approach a rotary (traffic circle), you must yield the right-of-way to any vehicles already in the rotary. If traffic is heavy in the circle, stop at the edge of the rotary and wait until you can safely enter. Only a few states in the U.S. have traffic rotaries, and as a result, many drivers are not familiar with the right-of-way rules. Be especially careful and generous when extending the right-of-way to other drivers." In practice, older cars in worse condition than yours, and other drivers who fail to make eye contact, always have the right of way in a rotary. Paul Schlichtman's road photos from New Hampshire and Vermont. Kurumi's Connecticut Roads. A well designed site full of information. Kurumi also features lots of fun nettoys including Sign Maker, Trippy Drive, and Me & the Roads. The Roads of Metro New York, Steve Anderson This extensive site also includes highways in New Jersey, Connecticut, and the Philadelphia metro area. County Roads on Long Island, Steve Anderson. I grew up four blocks from the northern terminus of Suffolk County Route 10, so this site is one of my favorites. Rhode Island Highways and Byways, Chris O'Leary This site includes a listing of Interstate highway exits in several New England states. Rhode Island Highways, Michael Kendricks. A complete listing of all the highways in Rhode Island. Maine Highways, J. P. Kirby (Not neighboring,but Maine was part of Massachusetts prior to 1820) J.P. also has pages for the Maritimes and Quebec. New England Interstate Highways of the 1920, Mike Moroney. A look at the first attempt to number highways in an interstate system. Massachusetts Bay Transportation Authority (MBTA), the "T"
New England Transportation by Scott Moore. An extensive site about New England public transit. Boston's Cancelled Highways by Scott Moore. Images and maps of the Inner Belt and other highways that were never built inside Route 128. Steve Anderson, the guru of nycroads.com, has expanded into the Hub of the Universe with bostonroads.com. Alexander Svirsky's massroads.com. This site includes a utility that allows you to reach the Federal Highway Administration's National Bridge Inventory database. 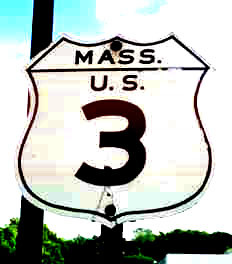 US Route 3 Widening Project, Burlington to Tyngsboro. Boston to Montreal High Speed Rail, Study Overview and Status. Images of America, Route 128 and the Birth of High Tech. A new book by Alan R. Earls. Visit the personal website of Boston Herald Roads Scholar columnist Robin Washington. Andy's Highway Kick-off Page. An extensive list of highway links. Richard C. Moeur's Manual of Traffic Signs. This site is the online bible for traffic signs, the next best thing to the Manual on Uniform Traffic Control Devices (MUTCD). Highway Route Markers, James Lin. A complete collection of US, Canadian, and other route markers. Signalfan's Homepage, John Reitveld. A history of traffic signals and photographs of traffic signal designs from around the world. Check out the traffic signals in his back yard, and the traffic signal tree sculpture in the middle of a rotary in London. A historical resource of US Highways by Robert V. Droz. The missing and hidden street name signs, though it is a common problem in New England. The dangerous traffic signs and signals that you should ignore. The traffic signal in Arlington Center has been fixed. Finally. The Minuteman Commuter Bikeway, in Cambridge, Arlington, Lexington, and Bedford, is the 500th "Rail to Trail" conversion in the United States. You can visit the home page of the Arlington Bicycle Advisory Committee. This site is in the early stages of development. Comments and corrections are welcome. Return to Paul Schlichtman's home page.